Wenford Bridge is the studio but who is the potter? Hello- I’ve two plates. One 8.25” across by 1.5” tall and the lighter one is 7.75” x .85”. 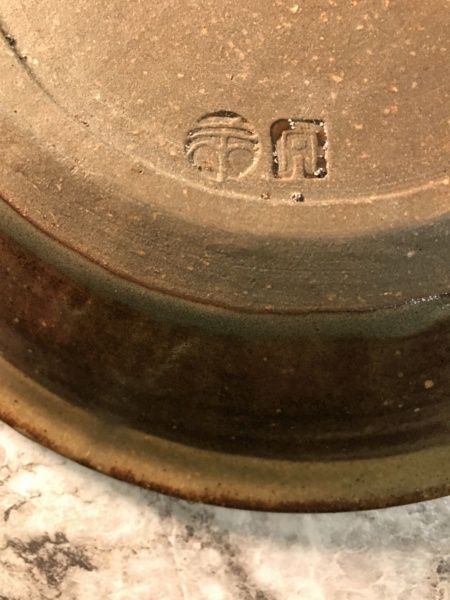 I’ve searched for a few days and still need help identifying the potter. Both pieces bear the same marks. Any ideas? Re: Wenford Bridge is the studio but who is the potter? Thank you Naomi. Are the photos clear enough? Not a mark I’ve come across before. Hopefully someone recognises it. Maybe by a potter who’s started there in the past few years or one on sabbatical? There were also a number of potters from the USA and others that now live there that were apprentices at Wenford Bridge. I did used to know several names but they have gone from the memory. Even Mark Hewitt, who I actually exhibited, was difficult to re-call. As these turned up in Vermont, my guess is that an American potter is most likely. I did not realise you were in Vermont. Some research gives a link with Michael Cardew and Wenford Bridge much closer to your home. Michael Cardew had two quite extensive visits to the USA in 1971 and 1972. In 1971 he did demonstrations and lectures at Swarthmore College Philadelphia.He visited the school of American Crafsmen in Rochester New York, and the big event of his tour talk and demonstrations at Arrowmint schoo, of crafts in Gatingburg. He stayed with the potter Charles Counts. One of the main ideas of this tour was to organise a tour by the Nigerian potter Ladi Kwali. End of June 1971 Michael Cardew stayed with Kent Benson an American potter who had a pottery near Montreal . Benson and Cardew were old friends, having worked together in Nigeria, and had a very long going friendship. Benson also visited Wenford Bridge and made some pots there. Could this be one of his? While staying with Benson, they visited Goddard College in Vermont where he gained support for the Ladi Kwali visit. In 1972 Cardew and the Nigerian potters Clement Athey and Ladi Kwali did an extensive two and a half month tour of the USA. Criss Crossing the South, moving on to Baltimoreand Morgan State College,Wahington at Howard University, New York at the Harlem School of Arts, then Chicago, Lose Angeles, Dallas and finally staying with the Pikers in New York. Micahel Cardew was also back in the USA in 1976, where he travelled extensively. Thanks to each of you for your prompt replies and background information. Each bit of information inspires me to look further. I'll post an update if I discover the potter. I've just come up with another name, Todd Piker, who works at Cornwall Bridge, Connecticut was at Wenford Bridge in the 1970s. I wouldn't think your plates are by him ……. but he might know who made them. I'll follow up on Mr. Piker. . I sent a note to Ara Cardew in New Hampshire and didn't recognize the mark. Miranda Thomas, one of Seth's students is here in VT as well. I may contact her this weekend. Miranda Thomas was a name I couldn't recall either. Looking at that mark again. 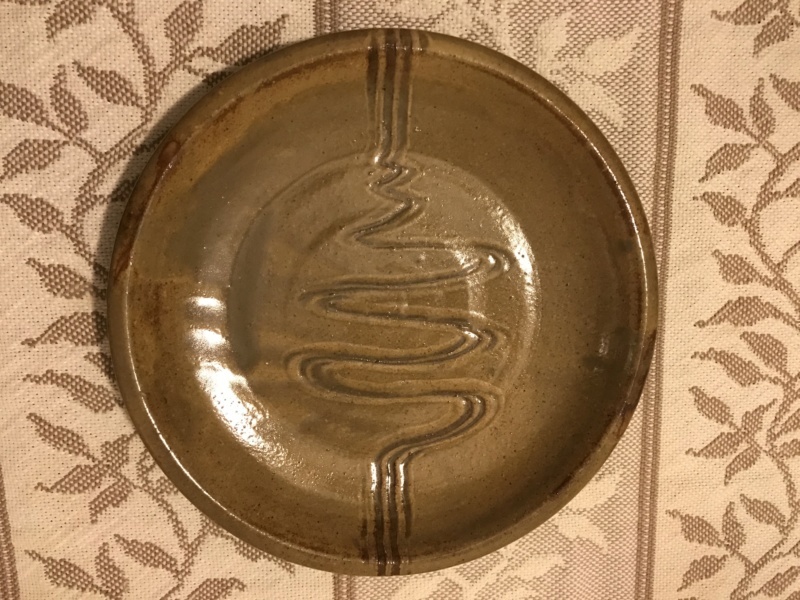 Another North American potter at Wenford Bridge was Sam Uhlick. Now does that look mark like an inverted U with an I in it? 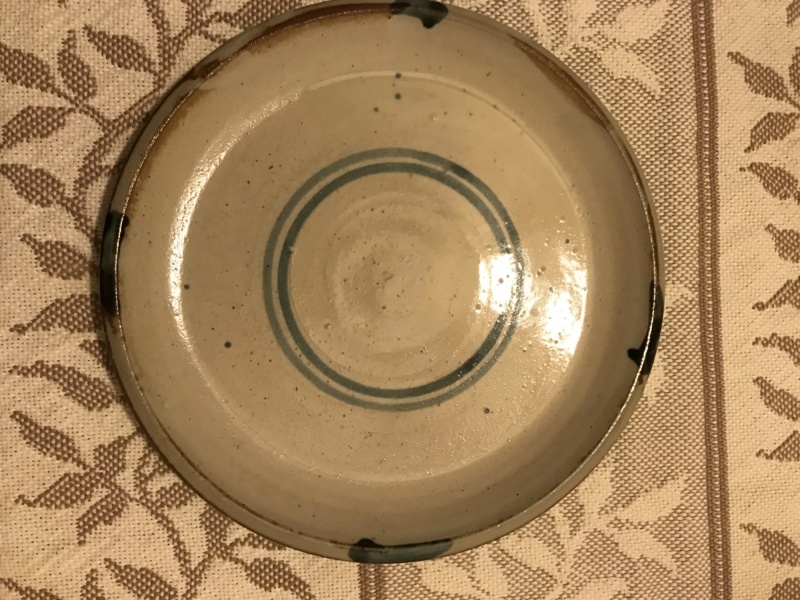 This is an auction link to the sale of a couple of his pots. Is the combing on that bowl similar? He is still potting in Canada. Might be worth getting in touch with him.